David has more then 10 years of computer security experience, including pentesting, consulting, engineering, and administration. 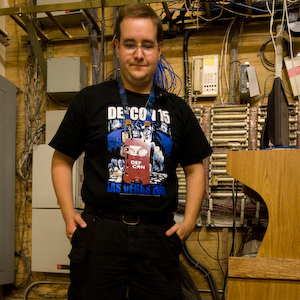 As an active participant in the information security community, he volunteers at DEFCON, where he designs and implements the firewall and network for what is said to be the most hostile network environment in the world. In his spare time he runs the local DEFCON group, DC612, is the president of The Hack Factory, and helps to run Thotcon as an OPER.